So here it is- my new website! The first task was getting all my different ranges of digital fabric printed, and then I had to make all the products ready to be photographed. I've never had so much stock! Next I had to prepare the canvas, which would be my backdrop. Coincidentally, my son's bedroom needed redecorating and with a bit of persuasion he was happy for me to paint it this lovely teal colour. As we'd had to clear it out for the plasterer, it was the perfect empty room set/studio. I painted the floor white and arranged for the lovely Jo Hounsome to come for a morning to do my first ever photo shoot of my products! I wanted to be able to show all the different ranges and colour ways now available in an interior space, so I created about six different room sets of the different ranges together. After Jo had gone, I took advantage of the studio space to personally photograph all the products individually- product shoots and lifestyle shots for my new shop-which will be the next mammoth job! So with all my new photographs ready to show, I moved on to tackling all the decisions involved in designing the actual website! Jo Hounsome was also responsible for doing the major building work for this, we chose the OM template. She'd already built our Fig website which I love, and I also looked at others she's done for other local designers. I spent quite a lot of time looking at other websites, which offered similar products and noting down what I liked about them. My lifestyle photo shoot was inspired by wanting to create a WOW picture on my home page. I wanted to give my audience an immediate taste of my signature colours, style and products and then hopefully they'd click through to see more! If you look at your website analytics, most people only look at one page, so if you have got as far as reading this blog then I may have done something right ! Another reason for building the new website was to make it more succinct and let he products do the talking. I've actually included just as much, if not a little bit more information, as I had in my old site. However, things like Contact, Newsletter sign up, T's & C's and Stockists are tidily slotted in at the bottom of my About page but I think it looks much simpler and cleaner because of the layout. I now have the all important, social icons easily visible on every page to encourage more followers. Instagram is my favourite social media app and it's where I post the most, so if you are really interested in keeping up with what I'm doing on a day to day basis, that's the one to follow! When Jo initially built the website for me she made the background a greenish off-white colour. I wasn't sure for a while whether I liked it. This was something I've discovered about making your own website; at times, you tend to know more of what you don't like, than what you do. The trick is knowing how to apply what you like and make it your own and this is a slow intuitive process for me. It was only right at the end of the process that I was definite that the pale green was not me. One of the things I struggled with the most was designing a new logo! I've wanted something that I can use on my website, my business cards, product tags, headers for my delivery notes and invoices and even put it on my digitally printed scarves- to create some proper posh branding. I didn't feel I had the money to pay for this to be professionally done. Also I knew I had the computer skills to design it myself, as I work in illustrator all the time. Illustrator allows you to design a logo that can be easily scaled up and down and put in different shapes and colour combos easily. I started off thinking I wanted to use a hand written name, so I scanned and live traced my writing. I used a drop shadow effect and even a seventies bubble written effect- cos I'd seen it done on a favourite Zandra Rhodes scarf I own! In the end I went back to using the typeface I've used all along Century Gothic it has a graphic but 1900's feel to it. I wanted to create a motif, which illustrated how I make my patterns. It seemed obvious to use graphic hexagon and flower shapes. I went through many different versions as you can see and quite often they looked wrong inserted in the small space allotted on my website. 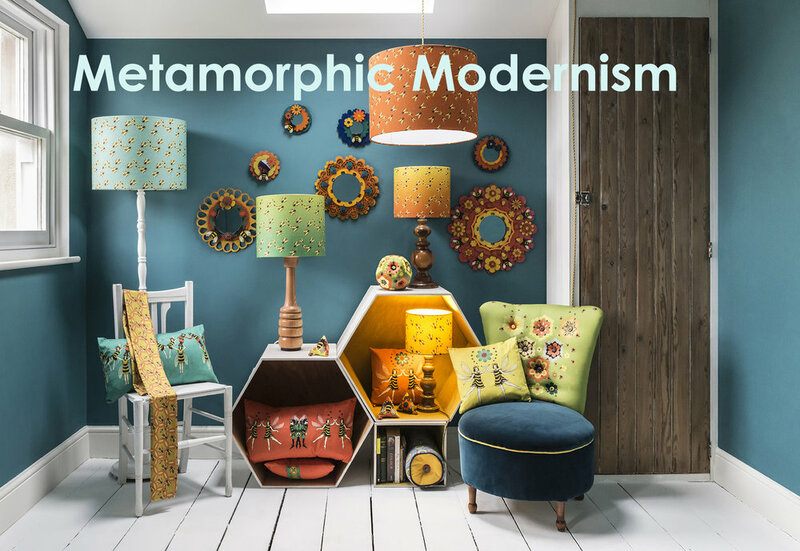 I also tried inserting the tag line- Metamorphic Modernism -which my husband came up with .I somehow instinctively knew when I'd got it right! This involved getting rid of the "Print" and using a blend on my motif . I showed my unfinished website to a couple of colleges at Fig and my husband, who's my biggest critic, and that was incredibly helpful. They know my work really well and were able to say whether they thought it worked or not, this gave me a bit of distance and perspective on it. So there you have it, my trials and triumphs of building a new website! That's one big juicey goal ticked off for this year!